Worksop boxer John ‘Punisher’ Popplewell made the perfect comeback from injury with a knockout win in front of around 1,100 people at the Barnsley Metrodome. Popplewell knocked out Jack Ferguson in the second round of their European Boxing Federation (EBF) super middleweight bout after stepping up two weight divisions. The Carlton-based fighter had not been in the ring for a year after two operations for knee injuries while training, the last surgery coming in June. 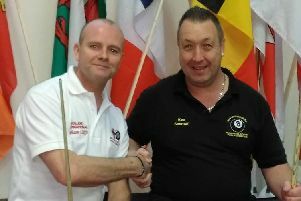 Popplewell, who paid tribute to the work of his coach and friend Neil Wain after the knockout, added: “It went to plan. I felt cool and relaxed going out to the fight. I picked my shots nicely and didn’t really get caught with anything. I dropped him in the second round and he didn’t get back up, so it was really good. Popplewell, a boxing, Mixed Martial Arts (MMA) foundation and fitness coach at Ludus Magnus Training Centre at Adwick-le-Street, was on the bill of the FkFOX Promotions Friday Night Fights III show in Barnsley. And after his fight, the 35-year-old then cornered for seven other Ludus Magnus boxers, including two British champions. Popplewell’s knockout win took his record in combat sports to 8-1, including seven knockouts or technical knockouts. He had switched to MMA a couple of years, but is now concentrating on boxing. “I’m 35 now and after the knee surgeries there are things I can’t do anymore — I can’t even skip. But I am training smart and was fitter than I have ever been for this fight.